Beckwith, Arrowhead Acres; Kristen Parsons, Chamard Vineyards; and Maureen MacDonald, Musto Wine Grape Company. 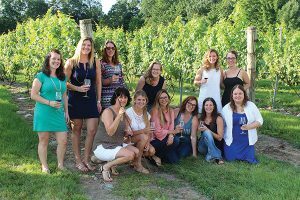 The Women Winemakers of Connecticut convened their August 13 meeting at Chamard Vineyards in Clinton. Maureen MacDonald, head of winemaking consulting and lab analysis at Musto Wine Grape Company, presented a comprehensive lecture on common grape diseases plaguing New England, with a focus on maintenance in the event of an outbreak. Additionally, there was an interactive discussion centered on filtration techniques and equipment presented by Amanda Brackett of Southern Connecticut Wine Company. Women Winemakers of Connecticut is comprised of 50 winemakers from all over New England, and was founded by Christina Musto of Musto Wine Grape Company, Brackett, MacDonald and Kristen Parsons of Chamard Vineyards. While originally founded as a support-based community for the exchange of information, today the three-year-old group comes together for themed monthly meetings where members highlight their successes, discuss their open projects and find solutions for local industry challenges. Musto currently defines the group’s objectives in clear terms: to help each other succeed and to design and provide a scholarship for young women interested in pursuing an education in wine. Q: The focus is on women winemakers. Is there an industry bias you see? A: While the wine industry is constantly changing and evolving, traditionally, winemaking has been a male-dominated task. Women may help in the fields and at crush, but they were seldom found in the cellars. Like in many traditionally male-dominated careers, women have begun to emerge as leaders and pioneers in the industry, gaining respect and admiration of their male peers. While there will always be a few naysayers, many gentleman winemakers in the industry have embraced women in the wine cellar and look to them as positive and important contributors to the industry. The reason that we have a focus of our group on women winemakers is that we are still a small minority in the industry and would like to gain positive exposure and experience as a united group. There are no other groups like this in New England and we feel that our group showcases an important emerging trend in the industry. Q: What issues are specific to women winemakers that perhaps male counterparts do not face? 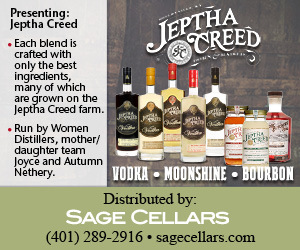 A: Women are now afforded the same opportunities as men within the winemaking industry. We have the same access to education, materials and funding that many men in the industry do. This has not been like this forever. The Equal Credit Opportunity Act of 1974 gave women the equal opportunity to gain credit and financing from banks and lending institutions and to apply for credit without fear of discrimination or assistance from a man. Prior to this, a woman was not able to independently apply for a line of credit to own her own winery. This was an important step for all women entrepreneurs. In contemporary times, there is still a bit of antiquated thinking regarding a woman’s ability to make wine as well as men. While those thoughts are luckily few and far between, they can still be obstacles for individual women to overcome when trying to gain employment and establish a reputation as a winemaker. Q: The group began with a focus on support and information exchange. The goals now include supporting and creating success for women winemakers. Can you elaborate more? A: We are a group of professional winemakers and wine industry members in Connecticut and other surrounding New England states who strive to create a collaborative and safe environment for learning and innovation to grow. 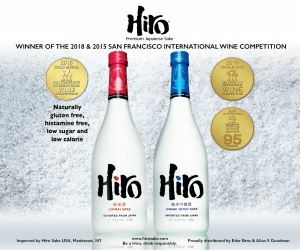 Our goals include raising enough to money to send young women to school to be enologists, viticulturists, or winery managers/owners, create a fun, safe space for learning and innovation for our members, and to bring more awareness to women winemakers/wine industry professionals throughout the U.S.
Q: What sort of track can someone entering winemaking expect to take? A: All roads lead to Rome; there are just a lot of different roads. Expect a tough two years of science-based work if you’re looking to get into winemaking and/or viticulture. Also, you’ll want to do some professional palate training (which is super fun). A lot of hands-on work is required, whether it’s working as a cellar hand or vineyard manager. Q: Can you talk more about the scholarship goal and its funding plan? A: The association dues will go toward the scholarship program, which we will start out supplying some type of stipend for their books. 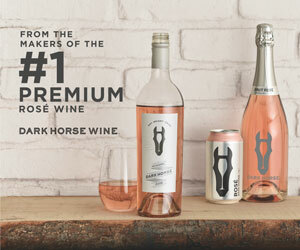 We would like to create a wine label by the Women Winemakers to sell in the marketplace and those sales would go directly to the scholarship program. We are also going for our non-profit, and are working on getting all of our ducks in a row so that we can move forward with the scholarship program. Q: The group is Connecticut and region-centric. Do you see a national group growing from your local efforts? A: Yes, we are growing each year. Currently we have members from Connecticut, Massachusetts, New Hampshire and Vermont. We think we will eventually grow to a New England or East Coast focused association with chapters being run in each state. It would be great to have a summit every year to get everyone together as well.